What is the best play-off path for the Denver Nuggets? STRIKE TWO: Some things have definitely gone right – even if the Denver Nuggets haven’t actually been tearing it up on the court the last couple games. Better to be lucky AND good. It’s not over until it’s over, as they say…and it won’t be over until after the Denver Nuggets play the Minnesota Timberwolves at the Pepsi Center Wednesday night. A lot of things can still happen. With a win, the Nuggets secure the #2 seed in the powerful Western Conference and a first round meeting with the #7 San Antonio Spurs (most likely.) It would mean a meeting between two very old rivals from the American Basketball Association. David Thompson v George Gervin. An old west shoot out. (Well, not exactly. Not anymore…) It would mean Denver would have to beat a Gregg Popovich coached team, which is never easy. Houston has already finished their season with 53 wins (the same number Denver has heading into the Minnesota game.) A Nuggets loss means a tie with Houston and the Rockets hold the tie breaker. 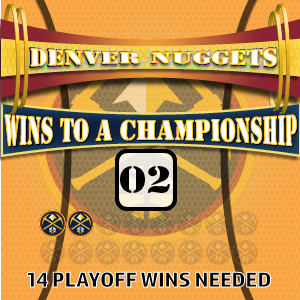 The worst the Nuggets could do is end up the #3 seed as the Northwest Division champions. But…a Portland win in their season finale against Sacramento Wednesday night will also give the Blazers 53 wins. So it could results in a three-way tie. A Blazers win means the Rockets end up the #4 seed and face 5th seeded Utah in the first round. That’d be great news for the Nuggets. All of this matters for seeding/home court advantage in the first round…but there’s more to it than that. “Match ups” also matter – and so do potential second round battles. Everyone wants to avoid top-seeded Golden State at all costs…at least until the conference finals. As the #2 seed, Denver could be on that path. BUT…and this is a big BUT… there are a couple other outfits the Nuggets would prefer to avoid…like Utah. And Houston to be sure. If Portland wins their final game and captures the #3 seed, they would take on the #6 Los Angeles Clippers with the winner of that series coming to Denver (IF the Nuggets take care of the Spurs.) The Nuggets have done fine against both those teams. Under this scenario, Denver avoids both Utah and Houston (who would face each other) in round two – two teams that have had the Nuggets number this season. Funny how that works, right? So the perfect situation going into the regular season finale is for the Nuggets to beat the T-Wolves – paying them back for the lost that ended last season and kept Denver out of the post season – and having the Blazers beat Sacramento to push Denver’s nemesis Houston down to the fourth seed. If these two things happen, we can turn our attention to the Spurs and perhaps finally getting over the San Antonio hump.